With a free full breakfast an indoor pool and in-room microwaves and refrigerators the Comfort Inn & Suites Sikeston is located conveniently close to shopping the interstate and many area attractions. This three-story hotel has 64 rooms some of which are designated non-smoking. Pets are allowed for a fee. Each room includes a mini-fridge microwave coffeemaker flat-panel cable TV hairdryer iron and ironing board. Guests enjoy a complimentary full breakfast each morning. There is an indoor pool a hot tub and an on-site exercise room. Laundry facilities and Wi-Fi access are also available for guests' convenience. 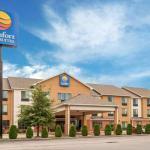 The Comfort Inn is a half-mile from Lambert's Cafe home of the famous throwed rolls and Sikeston Factory Outlet Mall. Drive four miles for entertainment at the Jaycee Bootheel Rodeo. Beggs Family Farm is a 15-minute drive and Orgill Inc. is 10 minutes away. Sikeston Memorial Municipal Airport is three miles from the hotel and it's 27 miles to Cape Girardeau Regional Airport.